You Don’t Have to Do it All! If you’re considering a digital, content, or inbound marketing program, you may be overwhelmed with the components of a comprehensive campaign. Many companies simply don’t have the staff, resources, or time to carry out all that goes into a successful marketing campaign. Outsourcing some of these components to a marketing agency can be a win-win. It allows you to focus on what you do best, your own business, while ensuring that your marketing is being carried out strategically by a team that has the skills and understanding to make your program successful and a great return on investment. A steady stream of blog content is critical to search engine optimization. It also establishes your company as an authority in your industry and a helpful resource for your prospects, leads, and customers. It provides assets for your social media profiles as well. A blog works best when it is updated consistently. An outsourced marketing company can provide thoughtful topic generation and sustained content creation that will keep your blog from growing stale. An outsourced company can also generate and maintain a blogging calendar, a critical piece to keeping your blog consistent, that identifies the key components of a blogging program, including the buyer persona you are targeting and the keywords you want to hit. Outsourcing your blog creation will also ensure you have a professional level of writing to maximize readability and minimize errors. It takes a special skill set to thrive on social media. Humor, energy, creativity, and an earnest attention to comments and reactions from your audience are essential. Do the people on your in-house marketing team have the time and temperament for long-term social media engagement? Do they have the versatility to go from the professional tone of a platform like LinkedIn to the playfulness of platforms that are popular with younger users, like Snapchat and Instagram? A company with a dedicated social media marketing team understands the unique ecosystem of each of the platforms and can maximize your presence on the platforms you choose to be active on. Digital advertising is a technical field that traditional marketers may find hard to wrap their heads around. Getting the most out of a pay-per-click campaign, understanding how to use result reports, taking advantage of remarketing techniques, designing effective social media ad campaigns - these are skills that are required of a digital marketing company. Do you want to use your staff’s time to train on these techniques and go through the trial and error that would mark the beginning of their digital advertising efforts? Or is it better to outsource these functions to a trained staff that will ensure your campaigns are well designed and optimized right from the start? Experience goes a long way with successful digital advertising, and an outsourced company will bring that experience to the table. When approaching marketing opportunities in the digital age, consider how well your in-house team of marketers fits. 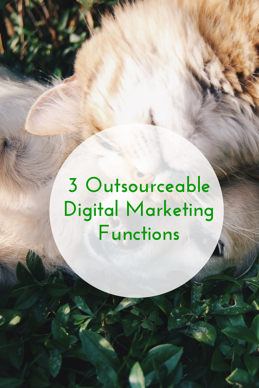 These three outsourceable digital marketing functions may be the place to start with an outsourced digital marketing company.